EURUSD sets a double top today. Rotates back lower. 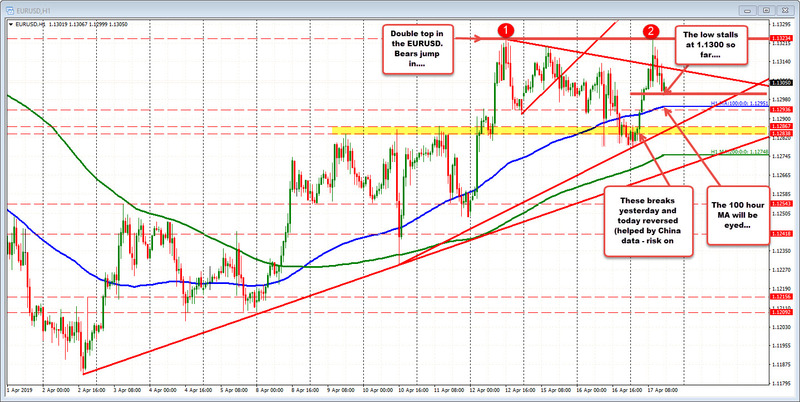 The EURUSD set a double top in trading in the London morning sesssion at the 1.13233. When the price cannot extend above a prior high, it sours the mood of the market traders. Let's face it, if long, you want to see the price take out previous highs and extend to new highs. Failures of breaks or inability to break a prior high is not a good sign for the bulls. Sellers have pushed the price back lower as a result, reaching 1.1300 so far. We currently trade at 1.1306. If the sellers keep the heat on the downside, the 100 hour MA (blue line) will be eyed at 1.12951 next. Below that is the trend line at 1.1284 and then the 200 hour MA at 1.1274 (and rising). Over the last 6 or so days, the price has moved below the 100 hour MA, with limited success. Yesterday and into today the pair made the strongest effort, but when the China data was better, the price started a rebound (some dollar selling/risk on buying). The low today also could not extend below the 50% of the last run high from the April 10 low (at 1.1276). That is near the rising 200 hour MA now (green line). So if tested today, it should be a tougher target to get below. For now, look for a move below the 1.1300 to give sellers the go-ahead to make a run to the 100 hour MA (really both need to be broken). PS For your guide there are some 1.5B of option expires at the 1.13000 level which may be stalling the fall (no guarantee but it can be an influence).